Best Bar Value on the River! Our pours are strong, our prices are good, and our cocktails are delicious! The Regency’s bartending staff is second to none. With fast, friendly, and often sassy and comedic service, there is no reason to go anywhere else for drinks. We pour at least an ounce and a quarter on every shot, which is more alcohol for your money than our neighbors offer. Our beer comes out of the tap at 34 degrees, so we are able to offer the coldest beer in town. 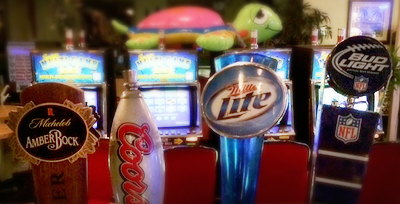 Now on tap: Bud Light, Coors Light, Miller Lite, Estrella Jalisco, and more! We also have a wide selection of bottled beer and cider all at great prices. Our large HDTVs behind the bar and outstanding service make any game day perfect. We often run special promotions and giveaways during big games. Call ahead for more information on any game or event. Weekly alcohol specials – ask one of our bartenders for the current featured drink!